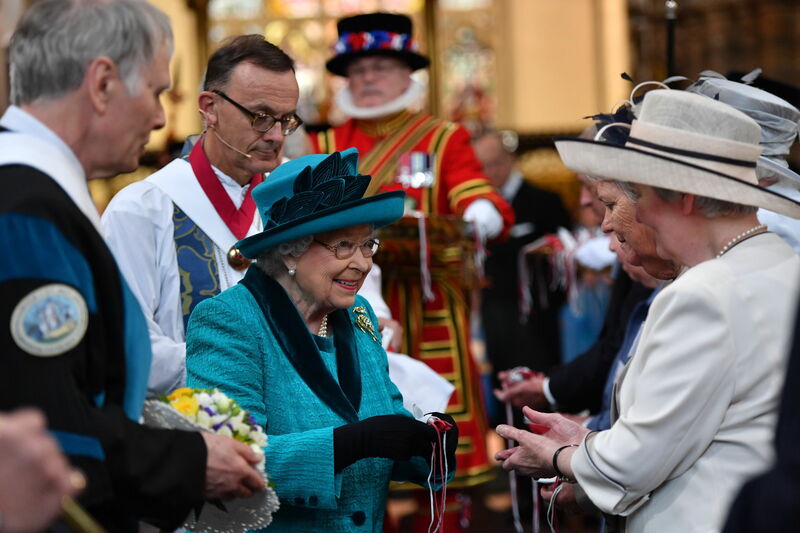 The Queen, accompanied by The Duke of Edinburgh, has visited Leicester Cathedral for the annual Royal Maundy Service and to distribute Maundy money. Dating back to around 600 AD Royal Maundy is one of the most ancient ceremonies in the Church of England. Following this year's Service in Leicester Cathedral The Queen has now visited every Anglican Cathedral in England for Royal Maundy. During the Service The Queen distributed Maundy money to 91 men and 91 – one for each of The Queen's 91 years. The recipients of Maundy money are retired pensioners, from all denominations, who have been nominated in recognition of their service to the Church and to the local community. This year each Maundy money recipient received two purses, one red and one white. The red purse contained a £5 coin, which celebrates the Centenary of the House of Windsor, and a 50p commemorating Sir Isaac Newton. The white purse contains coins that have been uniquely minted for Royal Maundy. This year there are 91 silver pennies, one for each year of The Queen's life. After the Service The Queen and The Duke of Edinburgh met Veterans from Leicester, before attending a reception and community lunch at St Martins House.